For GarageMate2.1 support, click here. If you purchased GarageMate in 2015 and are having trouble pairing with a Verizon Samsung Galaxy S7, S6, or S5, click here. Before you enter your garage, perform the following steps from the comfort of your home. Install the GarageMate App on your Androids and iPhones. Note: There may be two versions of the Android GarageMate App. Install GarageMate 4.0 or later. Earlier versions will not work. Plug the power adapter into an outlet. To make the GarageMate Receiver "ready-to-pair", hold the button for 4 seconds and then release. When you release the button the LED inside the receiver's case will start blinking once every 1 second. Open the GarageMate App and click the garage button. 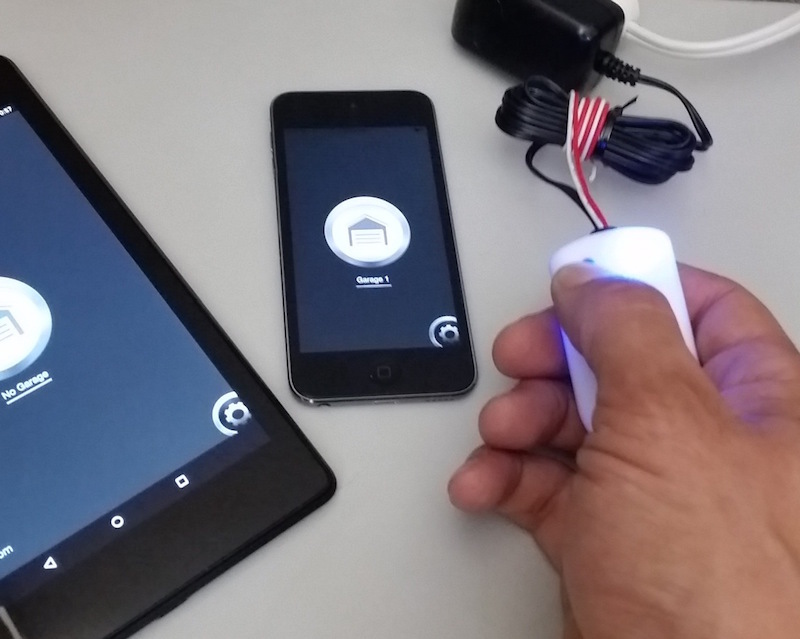 The GarageMate App will provide a 6-digit PIN/passcode. You can pair a total of 8 Androids and iPhones to your GarageMate Receiver. All of your pre-existing remotes and your wall switch will continue to function normally. Connect the GarageMate receiver's RED (+) wire and WHITE (-) wire to the same two terminals that connect to your wall switch . Usually the terminals or the existing wires will be white and red (if not red then blue, or black, or striped). The photos below show the terminals BEFORE connecting the receiver's wires. The terminals are designed to connect multiple wires. It may help to note that on some garage door openers the terminal for the white wire is known as "COM". 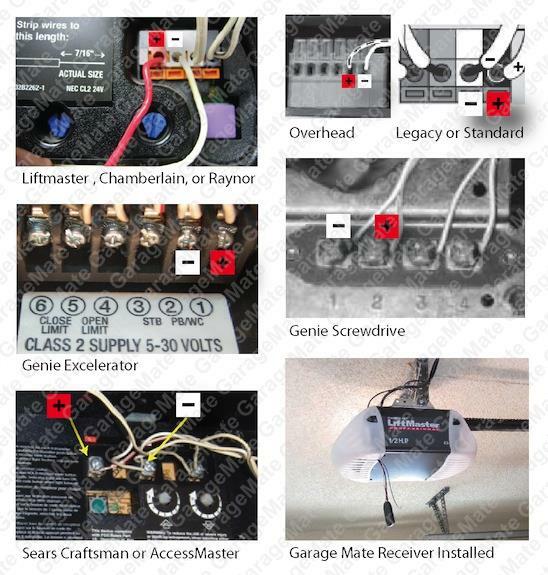 Do not leave any of the original wires disconnected from the garage door opener and visually check that no wires are accidentally shorting. 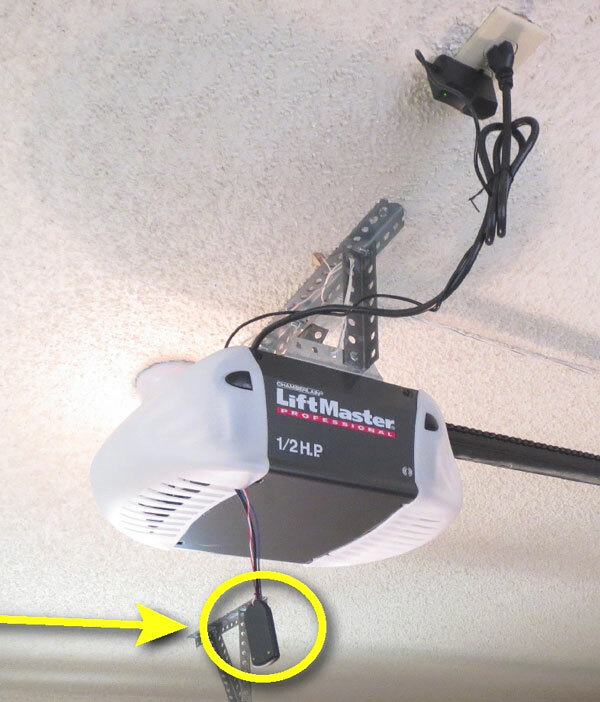 Plug the GarageMate Receiver into your ceiling outlet. GarageMate is ready for use, test opening/closing of your garage door by pressing the blue button. The photo above is an earlier black model of the GarageMate Receiver. For more wiring photos, click here.